Instability or risk premium is not being reflected in the US Mid West as much as it is in Europe in light of the Libyan situation. Following accidents in San Bruno, CA and Michigan, MI – pipeline safety legislation is likely to be added to the pile of regulatory activity related to the energy business which followed BP’s Gulf of Mexico fiasco. In fact, a bill on pipeline safety is already making its way through the US senate. There is also common conjecture that retirement of coal-fired power plants may assist in shifting established gas flow patterns (& prices). However, the Oilholic feels while this is likely to happen at some point, it will not happen in a meaningful way any time soon. Mid West’s problem is akin to that of Australia’s when it comes to power generation – a traditional dependence on coal which is hard to tackle. Gas prices, in any case, are likely to remain low as there are abundant supplies and storage levels are solid. Given that the US overtook Russia as the leading gas producer courtesy of shale gas, it is not bravado to assume that it could meaningfully export to Europe or that US-bound LNG could well be diverted to Europe. Moving on to refining, some local analysts are following the “things can only get better” logic for North American refiners – who they feel are well positioned to demonstrate a recovery (or some form of stabilisation) of their margins after six troubled quarters to end-2010. The speed of the economic recovery will have a big say in the state of affairs. 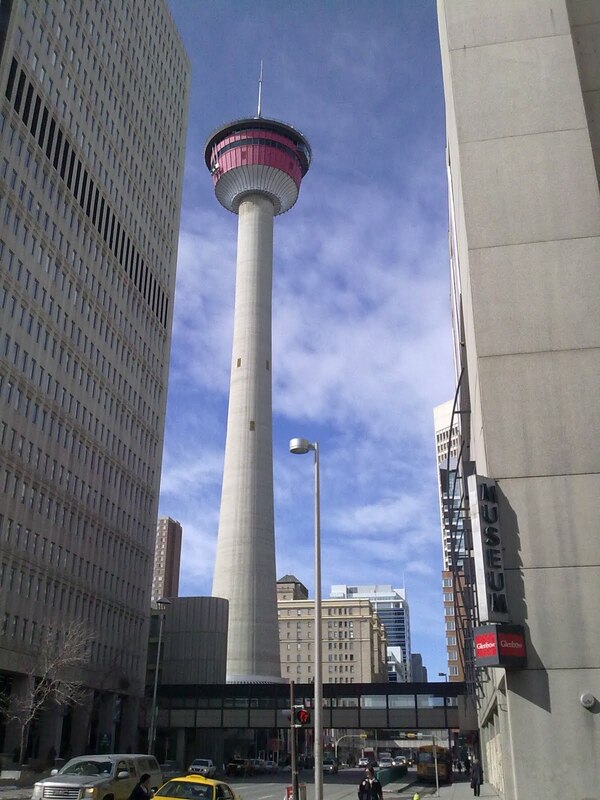 After leaving Houston, the Oilholic has now arrived in its sister Canadian city of Calgary – quite a switch from a sweltering 30 C on a Texan morning to about -4 C on an Albertan evening. While both cities do not share their climate – they do share the same sense of frustration about the delays associated with the expansion project of the Keystone pipeline. It seems Alberta and Texas are quite keen on the expansion – it’s just that everyone in between is the problem. The politics associated with this pipeline, as with other projects of its ilk is deeply complicated. However, this one involves cross-border politics, some of which has turned ugly especially in relation to the “cleanness” of Canadian oil. And by the way its “oil sands” not “tar sands” stupid, say the locals! 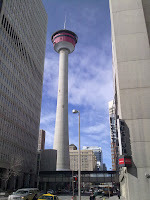 I’ll have more from Calgary shortly when I soak in and refine the local commentators’ viewpoints. It is difficult to say whether Texans in general and Houstonians in particular are more irritated or more disappointed with BP. Perhaps the answer is a combination of both, but anti-British the Texans are not. Many here feel let down by the company, a sentiment which had already been on the rise following the Texas City refinery blast in March 2005. News that the company is now trying to sell the asset does not assuage that feeling here. Many opine that when things were going horribly wrong in the Gulf of Mexico, BP could have done better, sought more cooperation from the government and not insisted it can handle things on its own. Some also blame their government of complacency for not intervening sooner and forcing BP’s hand. Nearly a year on, while a sense of disappointment has not subsided, no one here seriously believes BP has turned its back on a lucrative American market – a withdrawal from refining and marketing ends of the business is more likely. I think it is a dead certainty from a strategic standpoint. Now this ties in nicely to the company’s "Beyond Petroleum" campaign from a few years back. There was a fair bit of scepticism about it in England and elsewhere. 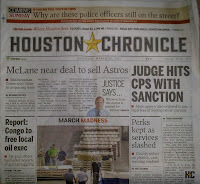 However, it seems the company continues to go beyond petroleum in Houston. In 2006, BP said it would set up its alternative energy business in Houston on top of an existing solar business in Frederick, Maryland. Five years hence and despite all what has happened, it is still going or rather has been kept going based on the 33rd floor of this city’s iconic Bank of America Center building on 700 Louisiana Street (see left). Asked about its prospects, the company did not return the Oilholics’ call. However, I visited the iconic building anyway courtesy of other occupants, especially Mayer Brown LLP, for which I am grateful. The next 12 months are crucial for BP. Americans are a largely forgiving bunch, but as Texans say forgiving is one thing, forgetting is another matter! And many have pointed out their disgust at Transocean and Halliburton too. Unfortunately for BP – the 'crude' muck stops with them. 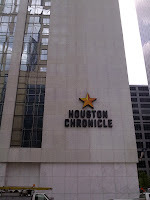 The largest daily newspaper in Texas – is still the Houston Chronicle, but while its reach extends well beyond the city, its character is uniquely Houstonian. It is that and that alone, makes the paper Oilholics approved. The content or better still – the coverage is much attuned to crude developments local, global or should we say glocal. You might say that in a town with deep historic ties with the oil & gas business that should not come as a surprise. However, it is how the coverage is slanted and present which I love reading both online and well nothing beats a paper copy when you can get a hold of it. 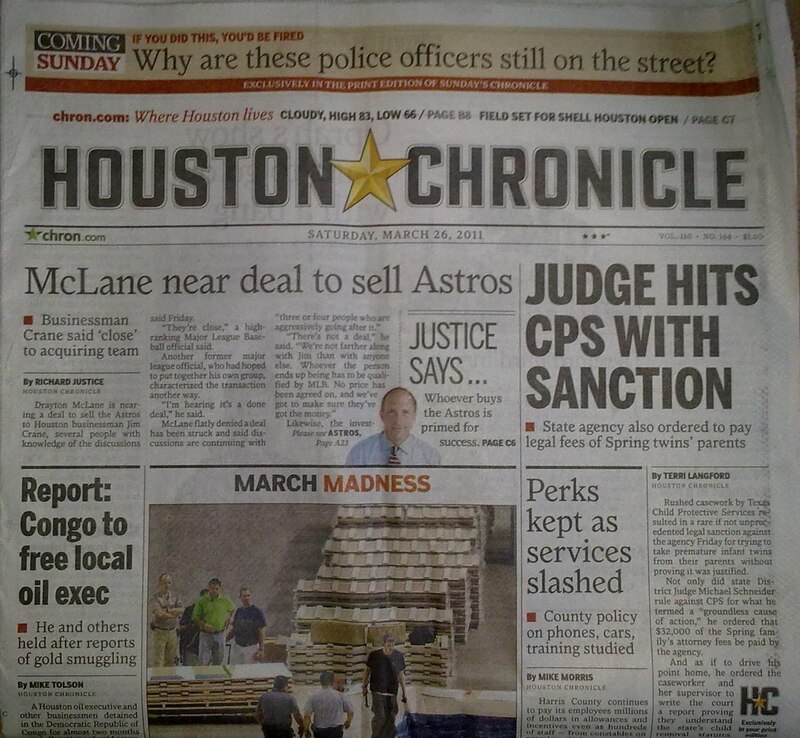 So on this visit to Houston, I see The Chronicle split as front section, city & state, sports, business (my favourite), the ‘Lone Star’ and classifieds and on Mar 26th there were four ‘crude’ stories. One mute point - the Hearst Corporation has owned it since 1987 and according to local sources it employs over 2000 people including 300 fellow scribes. The publication will celebrate its 110th anniversary in October this year, and seeped in its rich history is the fact that Jesse Holman Jones, a local politician, US Secretary of Commerce during World War II and President Hoover’s stalwart for reconstruction and development owned/published the publication from 1926-56. The late Jesse H. Jones' life is celebrated and commemorated in several monuments (and parks) in the city, but The Chronicle’s connection with the great man is a unique component of his legacy to his city & his country. While retaining the title of publisher until his death in 1956, Jones passed on the ownership to a trust in 1937. Sources suggest it has over 70 million page views in the internet age and amen to that! I had the pleasure of walking past its modern downtown headquarters earlier and couldn’t but help clicking the imposing building. 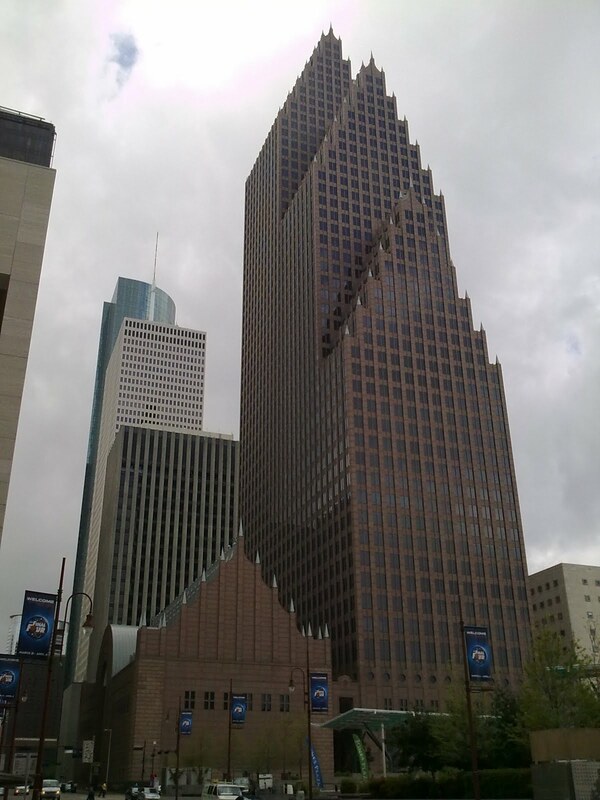 If you happen to be in downtown Houston, can you afford to miss 1500 Louisiana Street? It is not as if the building is the tallest in town. In fact, I am reliably informed that it is the 17th tallest. Quite simply the infamy that Enron came to signify for corporate America in general and the energy business in particular has given the building a place in history that it neither craves at present nor ever sought in the past. 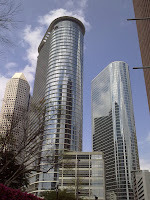 In fact prior to its collapse, Enron wanted 1500 Louisiana Street to be its headquarters but never actually occupied it in wake of its corporate scandal in October 2001. 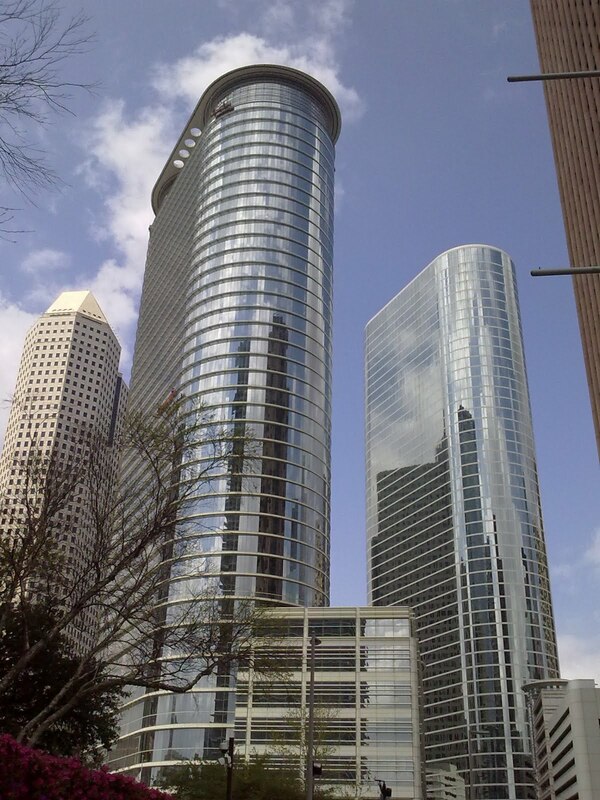 Following Enron’s collapse, the building’s leasing company touted it to quite a few including ExxonMobil next door but to no avail. Finally, in 2005 ChevronTexaco bought the building and moved its Houston offices there. The Oilholic couldn’t but help note with a wry chuckle this morning when an “out of towner” like him enquired of a rather irritated Chevron security guard whether the building was where Enron used to be. Enron never formally entered the building, but it seems the ghost of Enron never left. That’s judging by number of people outside clicking photos away in the three mornings that I have walked past it since arriving in Houston! So here's mine in keeping with that spirit. It is good to be back in the city that made the oil trade a business! With both ICE Brent and West Texas Intermediate forward month futures contract benchmarks above US$100 per barrel, Houston should be a happy place on this beautiful Thursday morning. Following a breakfast meeting with some ‘crude’ contacts, the viewpoints to emerge were more nuanced than I’d thought and some were in line with my chain of thoughts. But first things first, last I checked WTI forward month futures contract was at US$106.35/b and ICE Brent at US$115.60/b. An energy partner at a law firm, a commodities trader, an industry veteran and an oil executive were all in agreement that geopolitical bias for crude prices – well – is almost always to the upside. Recent events in the Middle East and whats going on Libya in particular is having more of an impact on the Brent spread, as it is more reflective of global conditions. WTI is more reflective of conditions in the US mid-west and as such many here believe even US$100-plus does not reflect market demand vs. supply fundamentals. Only medium term concern here, moving away from the geopolitical bias, is the perceived bottleneck associated with pipeline capacity (from Alberta, Canada) to Cushing and then southwards. This is unlikely to be relieved until 2013 (TCPL Keystone XL) or 2014 (Enbridge) and lets not forget the associated politics of it all. The Libya situation, most experts here say, may create a short-term spike for both crude benchmarks, more so in Brent’s case – but it is not going to be 2008 all over again – in the words of four experienced Texans and the pragmatic SocGen analyst Mike Wittner. Furthermore, market commentators here believe that over the next three quarters both speculative activity and investor capital flow in to the crude market (or shall we say the paper crude market) will be highly tactical as the current geopolitical risk premium (hopefully) eases gradually. As expected, local feedback suggests utilisation rates of refineries and LNG terminals locally is still low. While I attach a caveat that four experts do not speak for the whole state, the belief here in Texas is that refining margins, which have been pathetic for the past six quarters may show some recovery towards the end of 2011. As allied forces start bombing Libya and the full damage – both physical and reputational – to the nuclear generated power industry in wake of the earthquake in Japan is known, it is time to move beyond ranting about how much instability premium is actually there in the price of crude oil to what its impact may be. Using the Brent forward month futures contract as a benchmark, conservative estimates put the premium at US$10 but yet looser ones put it at US$20 per barrel at the very least. It is also getting a bit repetitive to suggest that fundamentals do not support such a high price of crude, even if the geopolitics is taken out of it. Thing is even profit taking at some point is not likely to cool the hot prices in the short term and the market has already started chatting about the impact. The tragic earthquake in Japan has added another dimension. Until nuclear power generation gets back on track in Japan, in order to meet their power demand the Japanese will increase the use of hydrocarbons as they have no other choice. Regarding the latter point, Ratings agency Moody's says that displaced demand from Japan's nuclear shutdown will shift to Asia-Pacific thermal-energy producers such as Australia's upstream Woodside Petroleum (Moody’s rating Baa1 negative), Indonesia's thermal-coal miner Adaro (Ba1 stable), Korea's refiner SK Innovation (Baa3 Stable), and Thailand's petrochemical firm PTT Chemical (Baa3 review for upgrade). Renee Lam, a Moody's vice president in Hong Kong, says, "These firms and others in the region can capitalise on near- and longer-term displaced demand as Japan must now rely more on non-nuclear fuel." Lam also expects global crude prices to remain high, despite a near-term drop from dislocation in Japan. She further notes, "Refinery shutdowns in Japan, accounting for 9% of Asian capacity and 2% of global capacity, have pushed up Asian refining margins. Strong margins benefiting non-Japanese, regional refineries should continue at least in the near term. We expect strong results for our rated refiners in the first half of this year." Additionally, Fitch Ratings says airlines and European Gas-Fired Utilities Unprepared for Current Oil Spike and that the substantial increase in oil prices in a short time frame has caught many corporate energy consumers off guard, as they are not properly hedged to cope with such high oil price levels. In a scenario of sustained high oil prices, corporate issuers that are heavily exposed to oil-related commodities feedstock are likely to face a direct impact on their earnings. In the agency’s view, management teams may be reluctant to hedge the oil price at these high levels, in anticipation of a softening in the oil price once geopolitical tensions subside. 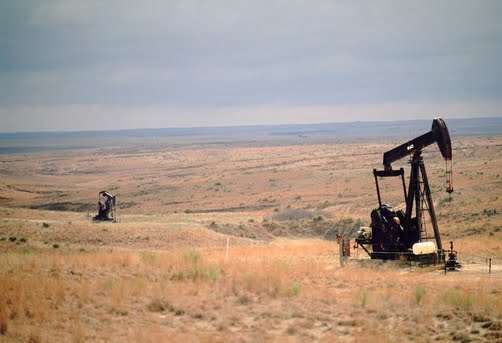 Fitch also considers it possible that banks might be less keen to finance oil option contracts at such high levels, as they do not want to take the risk of a continued rally in the price of crude. As oil price volatility remained fairly low in 2010, airlines seem to have been hedging less and are now more vulnerable to the current spike. In the current high oil price environment, an increasing number of airlines are taking a wait-and-see approach in anticipation of a softening of the oil price and perhaps due to higher hedging costs. 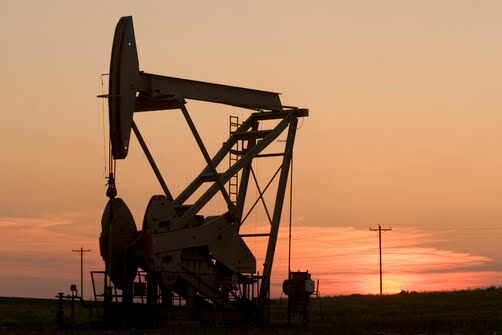 In Fitch's view, sustained oil prices well in excess of US$100 per barrel could negatively affect the operating performance and creditworthiness of high intensity corporate energy consumers and may also hamper the global economic recovery. Analysts at SocGen CIB note that the forward curve for Brent is currently in backwardation (nearby premium, forward discount) for the next 5 years, reflecting concerns over growing physical tightness in the crude markets. Especially, in light of the NATO/allied forces bombardment of Gaddafi forces last night, the market is pricing in an extended Libyan shutdown of crude exports. About 1 million barrels per day of crude oil production has been cut and Libya’s major exporting ports are now closed. As Nymex WTI-ICE Brent spreads have been less weak, SocGen analysts note that the front month spread has traded around -US$9.75/b on Tuesday vs -US$15/b one week ago. They opine that the recent strength of the WTI / Brent spreads has not really been due to the decreasing risk-premium of Brent, but more to very strong inflows of money on WTI-linked instruments. I feel it is prudent to mention (again!!!) that this blogger, all main ratings agencies and a substantial chunk of commentators in the City believe that a large portion of the current oil price spike has been driven by speculative activity rather than supply fundamentals. Oil supply has remained more or less balanced as most other oil producing nations have raised their production levels in order to keep overall production largely unaffected – so far that is! Finally, here’s an interesting segment of CNBC's Mad Money programme, where Jim Cramer talks oil n’ gas in the US state of North Dakota. It’s relatively small from a global standpoint, but could be important from an American one. As the situation in Libya worsens, depending on differing points of view of Gaddafi goons and rebel fighters, OPEC’s routine of sending conflicting messages does not harm the price of crude – something which I don’t think the cartel minds all that much over the short term. In fact the OPEC basket price of crude seems to be following Brent’s price more closely than ever. In a nutshell according to various newswires, Gaddafi militia and rebel fighters are toughing it out near oil terminals over 500km east of the capital Tripoli. Heaviest of the skirmishes have been outside (& within) the oil town Ras Lanuf, with both sides claiming a position of strength. A rebel spokesperson even gave out a statesman like statement, telling the BBC they would “honour” oil contracts. However, anyone looking towards OPEC to calm the markets got a ‘crude’ response and mixed signals in keeping with the cartel's well practised drill of letting the wider world indulge in a guessing game of whether a production increase was on cards or not. The Saudis sought to calm, the Venezuelans and Iranians tried to confuse and the rest were quite simply confused themselves. Moving away to a corporate story, pre-tax profits announced last week by UK independent upstart Tullow Oil have jumped 361% to US$152 million with a 19% rise in revenues to US$1 billion in the year to 31 December. In a statement to investors, its chief executive Aidan Heavey said the outlook was "very positive". I’d say its much more than that sir!